Marvelous Multiagers! : Noodles and Bagels! Just a few things tonight! First, let me show you this cute little thing we did this week. We are going on a field trip to a nature museum tomorrow (ahh!!) and part of our time at the museum will be observing butterflies. 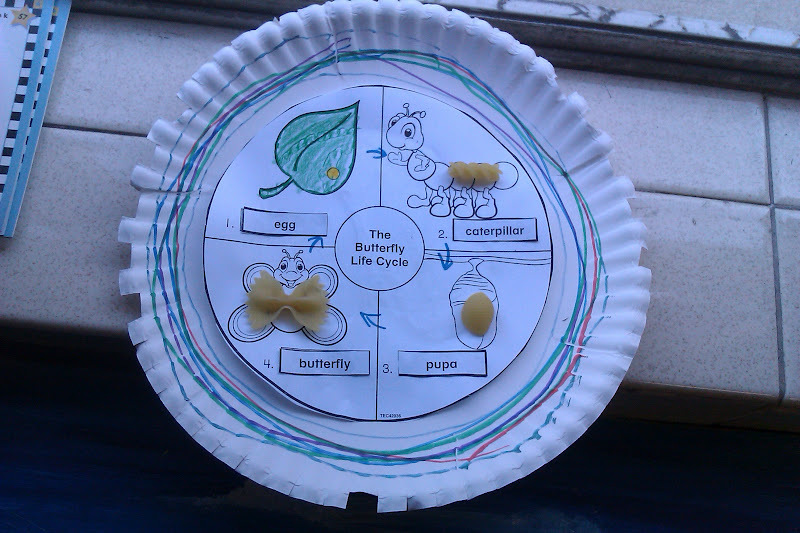 So we learned about the butterfly life cycle and made this little crafty thing. This is a printable from The Mailbox so I can't share it with you... but it would be pretty easy to make your own version. We used different noodles for each stage of the life cycle. I didn't have anything for the egg, but I would have used orzo or ditalini. For the caterpillar stage, we used rotini, for the pupa stage we used medium shells, and for the butterfly stage we used bow tie pasta! Or I think the box said farfalle... whatevs. It was a good assessment because I would hold up a pasta and ask which stage it represented, and I was able to figure out right away who knew what was up with the butterflies! I've also seen it where you use the noodles to make a little necklace of the life cycle. So there you go! Second, my natural resources post was featured on Bagels and Blogs today! Bagels and Blogs is hosted by Donna at Math Coach's Corner. She highlights 5 blogs a week with creative ideas that usually come with freebies! You should look at today's edition as well as past Bagels and Blogs posts! Third, if you were paying attention above..... we are going on a field trip tomorrow! I am feeling very anxious about it. We are taking a train AND a public bus so I just hope everything goes well. Keep me in your thoughts tomorrow! I did this activity for life cycles this year but we drew the pictures behind the pasta! It was so much fun!